While Sage wands and loose Sage leaves are very often used on their own in modern Sage and Smudge rituals, some other dried herbs and herbal combinations with Sage have also gained a considerable level of popularity in the sacred smoke ceremonies of today. It is not unusual to find smudge wands or sticks (or bundles) in the marketplace combining Sage and Lavender, Sage and Cedar, Sage and Juniper, Sage and Sweet Grass. You can buy wands, sticks or bundles with a combination of either Sagebrush or Sage leaves and one or more of these other herbs. It is also not uncommon for people who are carrying out modern-day aromatic sacred smoke ceremonies - cleansing, clearing or energy healing rituals - to combine loose sage leaves with other dried loose herbs. Many believe that burning two or more of the herbs simultaneously is a powerful way to combine the energy of the different herbs in the ceremony, ritual or process they are performing. You will find people using dried White Sage leaves and Mugwort, Cedar, Sweetgrass, or Tobacco (powder or leaf form) from the Native American tradition of the Shamans and people of North and South America. And it is also common to find people combining Sage with Juniper, Lavender, Rosemary or Thyme to create modern day aromatic smoke rituals and ceremonies in accordance with the ancient religions and traditions of their forefathers from other parts of the world. 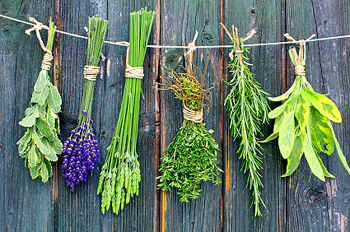 If you want a specific combination of herbs to use in your ceremonies, you may want to grow or purchase the fresh herbs. Bundle them together in a personalized herb bouquet, tie the base and hang the bouquet upside-down as you can see in the picture above. Or, you can spread them on a board or tray, each herb branch/leaf separately, and allow them to dry in a suitable place. If you are using the tray method, be sure to turn your herbs every other day until they are dry and crumble easily when you pinch or rub them with your hands. Then package and store your dried herbs carefully for future use. 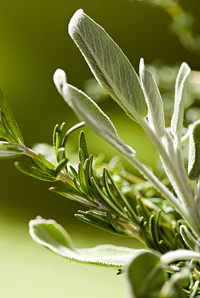 Read more about burning loose herbs on the next page.